Create your own small, enchanted space with plants, pavers, seating, and a water feature. Ever dream of a secret place where only you can go - filled with flowers and fragrance, and sheltered from the rest of the world by hedges or trellises? Or, a place where a softly dripping fountain soothes away the jangle outside, and time goes by so slowly that tomorrow seems like a distant dream? Ancient royals knew the value of privacy and a change of scenery. They built secret gardens within their palace walls. These were off-limits to everyone but the royal family - and the gardeners of course - these secluded retreats provided escapes from the rigors of court life. You may not wear a crown of gold and jade or need daily escapes to a locked-up garden, but don't leave the dream of a secret garden locked away in your imagination. Just find a spot away from your garden's center of activity - a forgotten corner under trees or alongside a fence, for example - and make it your own. A small backyard secret garden can be created in a weekend, often with inexpensive materials or items you may already have. You can lay pavers and a path first, then plant later. It can be a sunny spot or a shade garden - both soothe the soul. 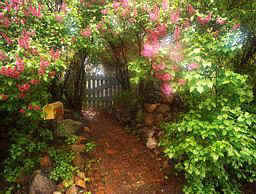 Locate your secret garden where it faces a great view or captures the magic of sunrise or sunset. If the northwest corner of the garden gets the first rays of morning sun in summer, this may be where you want to read the paper in your bathrobe and sip a mug of coffee long before the rest of the family stirs. Or you may look forward to disappearing after dinner to the top of a knoll looking west to the sunset, while enjoying a glass of wine and writing in a journal or curling up with a good book. Smaller is better. The space should be private but allow you room to breathe. A circular patio of brick, stone, or concrete with a 6-foot diameter is more than enough for you and - on occasion another person. It should feel intimate. Art. A favorite sculpture, piece of driftwood, gazing ball, or treasured stone can contribute to the feeling of personal ownership and give the garden a finished look. Flower color. A pot filled with blooming plants, a flowery vine (such as a lacy potato vine, Solanum jasminoides, scrambling along the fence), or a sweep of cottage pinks at your feet add seasonal cheer. Fragrance. In the ground or in a container, include at least one plant for scent. The perfume can be subtle--a lemon-scented geranium that needs a pinch to release its aroma--or sweetly pungent, as from jasmine or rose. We used stock and dianthus (plant both in fall), as well as purple heliotrope, with flowers that smell like baby powder (heliotrope is frost-tender; plant in spring). See the Fragrant Plants article for more choices. Furniture. All you need is one chair (two at most) and a little table or wide, low shelf on which to rest a glass of lemonade or a book. A bench can meet both needs - imagine it nested in a flowered arbor. If this is a snooze garden, use a lounge chair or hammock. Screening. A garden wall, fence, hedge, high shrub, lattice trellises and dividers, or a combination of these, lend a sense of enclosure. Sound and water. A softly spilling fountain like the table-top ones now available at reasonable prices, does a lot to mask the cacophony of the world outside. Kits for small ponds, equipped with pumps and fountain attachments are also reasonable, or one can be created in a suitable large dish or container. Two or three stalks of bamboo or tall grasses make a soothing rustle when a breeze blows (plant the clumping kind or grow small varieties in a big pot).